Chokri Belaid, who was gunned down outside his home on Wednesday, was a fierce opponent of Tunisia's ruling Islamists and a pan-Arab, left-wing activist propelled to the front of the political scene after the revolution. The head of the Party of Democratic Patriots (PPD), which was legalised in March 2011, did not pull any punches in attacking Ennahda, which heads the coalition government, and its veteran leader Rached Ghannouchi. On the eve of his death, he denounced what he called "attempts to dismantle the state and the creation of militias to terrorise citizens and drag the country into a spiral of violence". With his thick black moustache and striking smile, Belaid, 48, became a familiar face in the media and a key figure in the Popular Front alliance which he helped to form in October with other Arab nationalist and leftist opposition groups. The influence of the Popular Front, which presents itself as an alternative to the government and to the centre-right opposition led by former premier Beji Caid Essebsi, is hard to gauge in the absence of reliable polls. 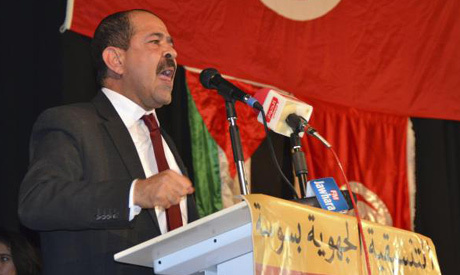 Belaid's party holds only one seat in the National Constituent Assembly. Born on November 26, 1964 in the Tunis suburb of Djebel Jelloud, Belaid worked as a human rights lawyer and acted for the defence in political trials during the regime of Zine El Abidine Ben Ali, who was ousted in the 2011 uprising. He served time in jail himself under Ben Ali and his predecessor Habib Bourguiba. Belaid was also a part of former Iraq leader Saddam Hussein's defence team, in addition to actively being involved in opposing the normalisation of ties with Israel. The opposition leader, whose movement sought recruits in universities, where it also confronted the rising influence of Islamists, served on a national body set up to promote political reform and democratic transition in the run-up to the first free elections after the revolution. With a populist streak, he retained the working class accent of northwestern Tunisia, where his family was from. When social unrest exploded into violence in the town of Siliana late last year, Belaid was among those leading the anti-government protests, drawing the criticism of Interior Minister Ali Larayedh, who accused him of stirring up trouble. Just last Saturday, Belaid had accused Ennahda "mercenaries" of attacking a gathering of his supporters. He was shot at close range as he was leaving his house early on Wednesday by a man wearing a traditional long garment with a pointed hood, according to Prime Minister Hamadi Jebali, who called the murder an "act of terrorism" against Tunisia. A furious crowd gathered outside the hospital where Belaida's body was taken, squarely blaming the Ennahda party, to which Jebali belongs, for his death and calling for a new revolution. I can not imagine those people who stand behind murders such nobel person i met him in 1996 in iraq .sory for his entire family the humanitarian before islam.. The killing was wrong, but the man put himself in the harm's way when he started badmouthing against the religion of most Tunisians. His murder was wrong but inebvitable. you should be ashamed of yourselve Chokri Belaid was a great person.